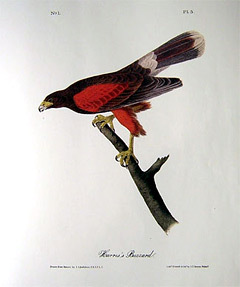 Pictured (right) is John J Audubon’s illustration of the Harris’s Buzzard, today commonly referred to as Harris’ Hawk. This hand-colored lithograph is Plate #5 from the Octavo Edition of Birds of America – created from 1840 to 1844. “The varying modes of flight exhibited by our diurnal birds of prey have always been to me a subject of great interest, especially as by means of them I have found myself enabled to distinguish one species from another, to the farthest extent of my power of vision. On considering this matter, I have become fully convinced that a greater length of the wings in any one species is not, as most naturalists have imagined, an indication of its greater power of flight. Writers of the present day who, judging of the flight of birds from such circumstances, think that those species which have longer and, as they suppose, more complete wings, fly with more rapidity than those whose wings are comparatively short, are, in my opinion, quite mistaken. They judge in this matter, not from experience, but from appearance, having previously determined theoretically that a long wing is a more efficient instrument than a short one; and being acquainted with birds only through the medium of skins and feathers, presume to inform us as to their comparative agility. The power of flight in birds of any kind depends not upon the length, amplitude, or shape of the wings, but upon the rapidity with which these members are moved, and the muscular energy applied to them. It is not a little surprising to me that not one of the authors who have written on this subject, has spoken of the mode of flight of our Turkey-Buzzard, which, notwithstanding, its very ample wings, is one of the very slowest birds; for, although it manages to rise to a great height, all its movements are laborious and heavy, unless when it is at some considerable elevation. The amplitude of its wings serves it in sailing only, never in enabling it to pass swiftly through the air, as birds of much shorter wings, but greater muscular energy, are wont to do. Taking somewhat into consideration the usual low flight of the latter species, I feel induced to place next it the very swiftest of our Hawks, as I am convinced you would consider them, had you witnessed, like me, their manners for many successive years. These are the Goshawk, F. palumbarius, Cooper’s Hawk, F. Cooperi, the Pigeon Hawk, F. columbarius, and the Sharp-shinned Hawk, F. fuscus. Though their wings are comparatively short, somewhat rounded, and rather concave, they have longer bodies and larger tails than any other of our hawks. The tail is used as a rudder, and appears most effectually to aid them in their progress on wing. None of these birds ever pounce on their prey, but secure it by actual pursuit on wing. Industrious in the highest degree, they all hunt for game, instead of remaining perched on a rocky eminence, or on the top branch of a tall tree, waiting the passing or appearance of some object. They traverse the country in every direction, and dash headlong in the wildest manner, until their game being up they follow it with the swiftness of an arrow, overtake it, strike it to the ground with wonderful force, and at once fall to, and devour it. Although the flight of our Passenger Pigeon is rapid and protracted almost beyond belief, aided as this bird is by rather long and sharp wings, as well as an elongated tail, and sustained by well regulated beats, that of the Goshawk or of the other species of this group so very far surpasses it, that they can overtake it with as much ease as that with which the pike seizes a carp. I have often thought that the comparatively long tarsi of these Hawks, as well as their elongated and padded toes, are of considerable assistance in securing their prey on wing, as they throw these members to the right and left, upward or downward, when about to come into contact with the object of their pursuit. In boldness and ferocity they probably surpass all other birds of prey. The next race is composed of the species called “True Falcons,” of which we have the Jer Falcon, Falco Islandicus, the Peregrine Falcon, F. Peregrinus, the Pigeon Hawk, F. Columbarius, and the Sparrow Hawk, F. Sparverius. These birds are probably the most highly organized of the series. Their wings are pointed and somewhat broad; their tail is not only considerably elongated, but has a firmness and elasticity not seen in that of the other species. While in Eagles and other sluggish birds of prey, the motions of the wings are slow, in the species now under consideration they are strong and quickly repeated. They moreover possess the power of swooping in a higher degree than even the Eagles, for although much smaller birds, they are if any thing still more compactly formed, whilst they are at the same time endowed with at least a fair power of flight, so that they give chase to the swiftest birds, and not unfrequently overtake and destroy them. In their migrations they differ from the slow-flying species, which seldom remove far from the place of their birth, for they appear to delight in following the myriads of the feathered tribes from which they have derived their subsistence during summer in the northern regions, to those southern countries in which they are sure of obtaining an ample supply, each species pursuing those on which it more usually preys. Thus, some, as the Peregrine Falcon, will remove as far as the confines of Mexico or the extreme portions of California. The Jer Falcon, which mostly feeds on Hares and Grouse, belonging to northern countries, and which of course migrate southward to a very short extent, rarely advances far; while the Pigeon Hawk, as daring as the Peregrine, follows the Red-wings, Rice Birds, and other small migratory species, with a pertinacity not in the least surpassed by that of the Peregrine Falcon itself. Adult Female. Bill short, robust, as broad as high at the base, compressed toward the end; upper mandible with its dorsal outline sloping a little at the base, then decurved, the sides nearly flat, the edge with a slight festoon, the tip prolonged, trigonal, descending, acute; lower mandible with the angle rather long and wide, the dorsal line convex, the edge decurved toward the end the tip obtuse. Nostrils rather large, ovate, oblong, oblique.